Some stars look single to the naked eye but really are two stars orbiting each other. These binary systems form when giant clouds of gas and dust collapse gravitationally into two condensations instead of one. Sometimes, just by chance, the orbital plane is nearly along our line of sight to the stars. When this happens we can observe eclipses as the stars pass in front of one another during orbital motion. Here are light curves for some eclipsing binaries measured at Winfree Observatory. W Ursae Majoris is a binary star about 200 light years away. The larger star of the pair has 99 percent of our Sun's mass, has 1.14 times the diameter of our Sun, and puts out 1.45 times more power than our Sun. The smaller star has 62 percent of our Sun's mass, has 83 percent the diameter of our Sun, and puts out the same power as our Sun. The stars are so close together they actually "touch". I observed this star on the night of December 27-28, 1994, taking 123 images, one every four minutes for the entire eight hour orbital period. Each exposure was one minute long. The brightness of W Ursae Majoris was then measured in each image, and a light curve was plotted to show how the star's brightness changed with time. 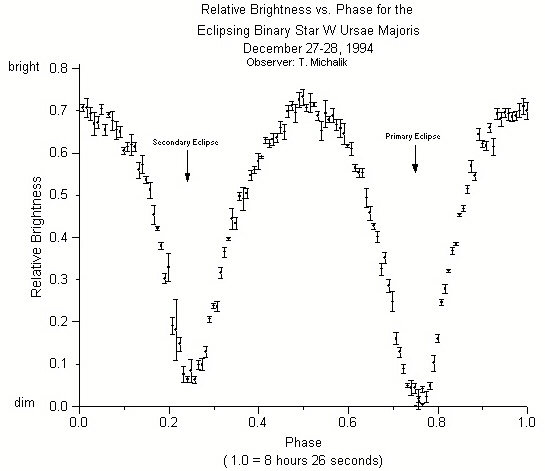 More light curves of eclipsing binaries can be seen on the student projects page.